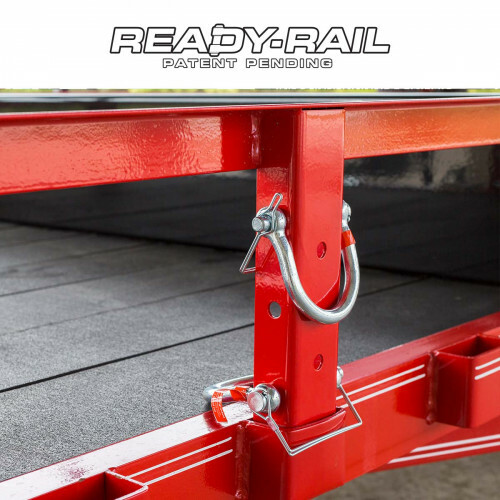 Stock up on Ready Rings (patent pending) and be prepared to tie down nearly any load to your Ready Rail® trailer. 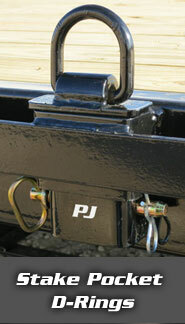 These rings attach directly to the rail uprights on PJ utility trailers, on either the inside or the outside. With a maximum inner width of 3”, they’re perfect for use with multiple styles of tie down hooks and straps. Each ring includes a beefy lockable through-pin with a retaining clip, and is rated for 1,275 lbs. Can The rings be powder coated to match the color of my trailer? These are only available zinc plated at this time. I purchased 6 D rings and a spare tire holder. The D rings are much heavier duty than I expected. I just used them to secure a 3000 pound utility tractor. I used 4 D rings and they worked fantastically. The spare tire holder is also heavy duty. I like that I can easily more it to a different location if I want to. I'm happy with the Ready system.